Custom designed coil supports to replace wooden supports. 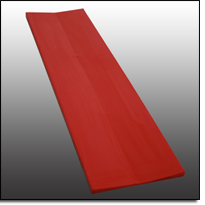 Urethane coil supports are oil and cut resistant and can be made in various colors for safety. Standard Urethane Coil Storage Pad. Used to store aluminum or steel coils. Diameters ranging from 24"-90" coils. Standard Urethane Coil Storage Pad. Used to store aluminum or steel coils. Diameters ranging from 24"-90" coils. Shown with oil pan reservoirs and bolt holes. “C” hooks can be covered directly to the metal hooks if pads cannot be bottled or welded to the metal hook. Totally covering the hook gives complete protection when lifting steel and aluminum coils. Custom designed coil blocks to replace wooden supports. Urethane coil blocks are oil and cut resistant and can be made in various colors for safety. Coil blocks can also be used to store work rolls. UUP can custom manufacture urethane coil saddle blocks to meet any specification. Inexpensive tooling allows for a custom made product. 20 Urethane coil floor pads ready for LTL shipping.